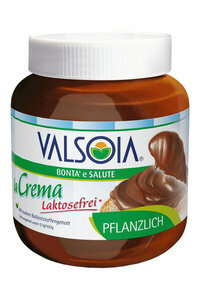 Valsoja La Crema is a delicious herbal cream with hazelnuts and skimmed cocoa, which is ideal for a valuable breakfast or a tasty snack! Enriched with soy fiber, lactose-free and gluten-free! For a good start to the day! Always Valsoia offers a wide range of herbal products that are ideal as part of a healthy and tasty food for all the family and of high quality. Products that contribute every day to maintain your well-being and maintain. sugar, vegetable oil, hazelnuts (14%), soy extract in powder form (8%), low-fat chocolate (8%), soy fiber (4%), emulsifier: lecithin, flavoring. Allergy advice: May contain traces of milk protein, peanuts and other nuts.